Forest landscape with a pond was executed in the last quarter of 19th Century by good listed Austrian landscape painter Carl (Karl) Bobies (1865 - Vienna -1897 ). Carl Bobies came from a family that had emigrated to Austria in the 18th century and whose roots were in East Prussia and Lithuania. He was a cousin of Carl August Bobies (1853 – 1922), the later general advocate of the Supreme Court in Vienna. His uncle was the Viennese municipal council and co-founder of the Schubertbundes Franz Bobies (1826 – 1891), his great nephew was the Viennese dermatologist Wolf-Dietrich Wittels.Carl Bobies studied at the Vienna Academy and became an academic painter. His pictures still show a certain naturalistic depiction, but the graphic element is already clearly behind the color as the primary design means in the background. The execution is rather sketchy and gives the essence precedence over the fidelity of detail.1894 at the 3rd International Art exhibition at the artist union Künstlerhaus in Vienna, he exhibited an "evening atmosphere on the Danube" and a pastel painting "early spring". From 1897 he was a member of the Viennese Künstlerhaus. On the 280. 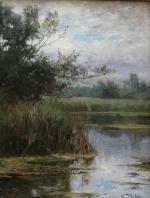 Art auction of the Wiener Dorotheum (December 1917), under Number 909, an 1894 dated and "K. Bobies" signed pastel painting "Early spring in the Donauauen" was auctioned. In the collection Ludwig Lobmeyr was a 1890 with "K. Bobies" signed watercolor "old court in Weissenkirchen at the Danube“.In 1954 the "Bobiesgasse" in Vienna was named after him in the 23rd District. 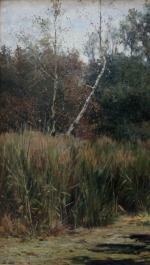 Measurements: unframed w 27 1/8" x h 20 1/2" (69 x 52 cm), framed w 29 7/8" x h 23 1/4" (76 x 59 cm).